Impact DDG program is a unique consortium program that is tailored to the needs of large organizations with a mandate to deliver innovation-fueled growth. A limited number of non-competing organizations will be invited to participate. Member organizations can enroll up to six participants; or as few as one; depending on their needs. All program participants will be potential growth catalysts within their sponsoring organizations, meaning that they are sufficiently senior that the impact of their increased proficiency will have a powerful leverage effect. The program will consist of onboarding activities, incorporating completing the Innovation Proficiency Scale, articulating specific objectives for the course (which will influence its design), conducting an initial growth gap analysis and portfolio review and working through a core set of preparatory material. Subsequently, four in-person face to face meetings will be held in New York City. These sessions will be facilitated by Rita McGrath in person, with selected invited guest speakers. Throughout the year, participants will have access to webinars, online discussion groups, faculty ‘office hours’ and each other. Since the program will include organizations from different sectors, it will lead to far richer insights than those available at standard industry conferences or even executive courses. It’s our belief that people learn best when they’re actually working on their own projects, so we’ve designed the program to address real-work topics, whether that’s an innovation you’re actually working on, a space that you’d like to explore, or a digital transformation. 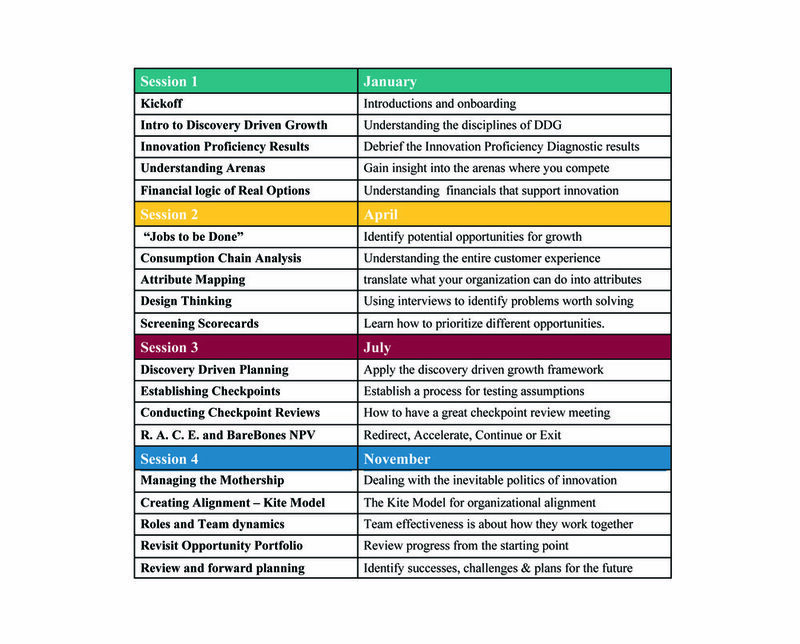 In addition to the sessions outlined below, participants will have continuous opportunities to learn from their peers.